This page contains some of our most popular complete packages arranged in terms of price. If you are unsure about which package may best suit your needs please do get in touch. Each one is fully customisable to suit your needs. Our standard packages come supplied with the latest lightweight Matrix XT or QSC PLX Power Amplifiers, DBX/XTA or Modified Behringer Loudspeaker Management Systems, and high quality cables made by ourselves. All our kit is safety and operationally checked before and after every hire, we even clean the cables! This is the smallest speaker package we have. 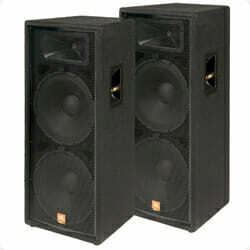 Consisting of a pair of high quality Electro-Voice (EV) SX80 top cabs paired with an Electro-Voice SB121 12″ subwoofer. 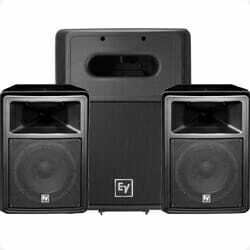 This system is perfectly suited to children’s parties, small film nights, and other events which require a full range sound without extreme volumes. That said they are still capable of a very loud 121db! The low weight speakers make transport stress free. 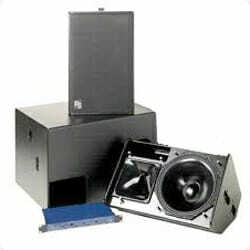 Supplied with speaker stands, loudspeaker management system, amplifier and cables. Or double the bass for £125 all in! There are times when a small system is more suitable, whether it be due to limited space, a smaller audience size or to fit in with the decor, sometimes it pays to be discreet. For moments like these we call upon our collection of RCF Monitor R88s. Standing in at a diminutive 43 x 29 x 26 cm (HxWxD) they may be small, but with their cutting edge technology still output 120db of clear, concise sound. So whether you have a presentation, tradeshow or a book launch these are the perfect little speakers. A pair of these for talks and presentations will cover upto 150 people. Supplied with speaker stands, controller, amplifier, a microphone + stand, and a small mixer. Or double the speakers and amps for £150 all in. This HK system is perfect for most small to medium events for general use. 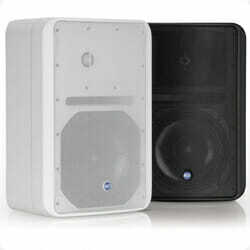 Featuring two high quality 150w 8+1″ Satellite speakers with a matching highly efficient 600w 15″ subwoofer. 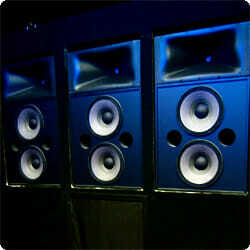 The amplifiers, crossovers and limiters are all built into the back of the subwoofer making it extremely quick to deploy. We’re talking just a few minutes here. Perfect for 3 piece bands, discos, weddings, film nights, presentations, you name it. It really is the most versatile setup we have. 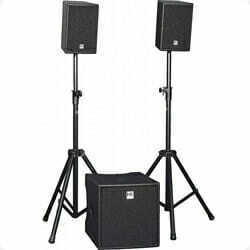 Comes supplied with speaker stands, leads and a small mixer. Or bolt on a stage monitor package for just £200 all in! The JBL Rig Potent little system featuring a pair of modified JBL JRX125s and 4x Radiance Audio 12″ Compact Subwoofers! We use this system for the majority of our small to medium performances to cover upto 200 people. It goes very loud and the bass is incredible for such a small system. It’s perfect for most parties and live music performances. Comes complete with the loudspeaker management system, amplifiers and all the cabling you need to get started. Or bolt on the “DJ” or “Live” bundle for £300 all in. The Disco/Rollerderby Package The perfect system for clear announcements and music! This is our most requested system for Rollerderby Bouts, Discos, and Weddings. The Nexo PS15s provide crystal clear full range audio over a wide area, while 2x Radiance Audio 12″ Compact Subwoofers provide low frequency reinforcement making it perfect for music and announcements. This system comes with 2x microphones, a small format mixer, a compressor, 2x speaker stands, loudspeaker management system, Nexo controller, amplifiers and cables. Choose this system on its own for £250. 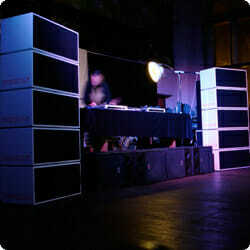 The Radiance Live Rig Quite possibly the best sounding system you will ever hear! This is a one of a kind sound system, hand built by us for exceptional quality and depth of sound. It features 4x high excursion 18″ reflex subwoofers, 16x 12″ reflex drivers covering bass and low mid, 2x 12″ covering mids, 2x 2″ Titanium Compression Drivers on high mid duty, and 2x Diffraction Slot Tweeters for the high frequencies. It sounds effortless and completely transparent. This system will cater for upto 1000 people for live music. Comes complete with the loudspeaker management system, amplifiers, graphic equalisers and all the cabling you need to get started. Oh and a techie. Or contact us for tailored addons. The JBL ScreenArray Fully fledged THX certified 9.1 cinema sound system! You read right. We are one of, if not, the only company in the world who can hire you a full JBL THX certified cinema sound system by the day! This is the very system that is installed in your local cinema complex, and now you can hire it for your film nights and screenings. We can do full 9.1 Surround Sound and even supply the playback and projection kit. This system will easily cover upto 1000 people. Comes complete with Decoder, Processor, Management Systems, Amplifiers and miles and miles of cable. Or add on the full projection package for only £2000 all in.